Athena Brass Band will be one of the featured ensembles at IWBC 2019 in May 2019 at Arizona State University, Tempe, AZ. More details about this exciting event will be announced soon. The Athena Brass Band is the first all-female brass band in the United States, named after Athena, the Greek goddess of wisdom. 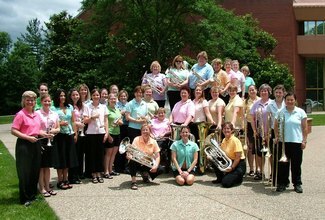 The band was formed in 2003, by Laura Lineberger, to to perform at the International Women's Brass Conference. This successful debut resulted in invitations to perform at the Great American Brass Band Festival in 2005 and a return to the IWBC in 2006, followed by a Brass Band Invitational at Indiana University Southeast in June 2009. In 2012 Athena Brass Band gave the first performances of Athenian Fanfare, which was written for the women of Athena Brass Band by Lisa Galvin, at IWBC 2012 and the Gettysburg Festival. In 2014 Athena Brass Band returned to IWBC, and in 2015 Athena returned to Gettysburg, for the Gettysburg Brass Band Festival. In putting together the band, Laura first enlisted Anita Cocker Hunt as conductor (Anita is the conductor of Cincinnati Brass Band and was then President of NABBA, the North American Brass Band Association) and then set to work contacting some of the best women brass players in the U.S. Jessica Sneeringer and Kate Wohlman have also taken their turn on the podium, directing the band. The Athena Brass Band musicians include current or former members of the U.S. Army Band, the U.S. Coast Guard Band, Brass Band of Battle Creek and the New Sousa Band. There are several college professors and public school music educators, conductors, music therapists, a sound engineer, a music publisher and a composer; also a nuclear physicist, a biologist, a sociologist, an MBA and an author. Most of the ladies also play with a NABBA brass band. The Band manager finds a suitable venue - it must be able to provide rehearsal space for at least one day prior to performance, assistance in sourcing larger percussion instruments locally, inexpensive housing options and a nominal fee for our immediate expenses - and then Athena gets to work! This group is unique in that the women within the ensemble come from all parts of the United States: from California, Florida, Michigan, Texas, and Ohio, to name a few. They are not paid for their work and most fund their own travel expenses. Each member finds that they are far richer without being paid a penny. What is our secret? We happily perform because this group of ladies loves to gather, work together and make incredible music for the sheer love of Brass Band music! We have a waiting list. Whenever and wherever Athena Brass Band gets together to rehearse and perform, audiences are delighted with Athena's zest and love for music.